Millbrae, an intermodal transit center is the southern terminus of BART in San Mateo County and as far south as this line goes. 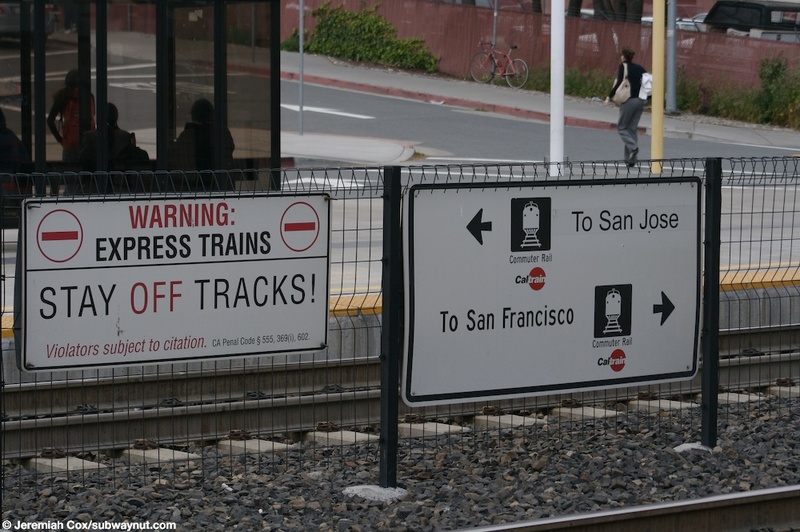 Here passengers are provided easy, same platform interchange, when getting off of San Francisco-bound Caltrains only between BART and Caltrain. 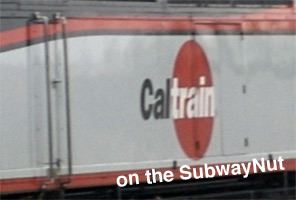 The area has always been a stop on Caltrain although trains stopped just south of the present station (south instead of north of Millbrae Avenue) until June 23, 2003, the first weekday with Caltrain service after the BART extension opened on Sunday, June, 22, 2003. Here the historic 1907 station house was open with a ticket agent until 2003 and the ticket agent was relocated to the concourse level for the next few years until 2005 when all ticket agents were illuminated at intermediate stops except San Francisco and San Jose. 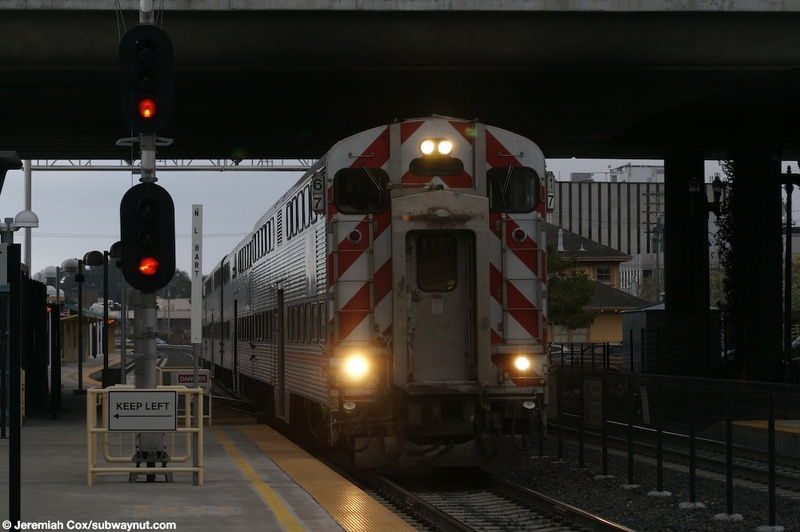 Caltrain service to the station is from nearly all trains including all Baby Bullet Express trains, just a few (2 in the AM rush per-direction, 3 in the PM rush per-direction) Limited Trains skip the station. 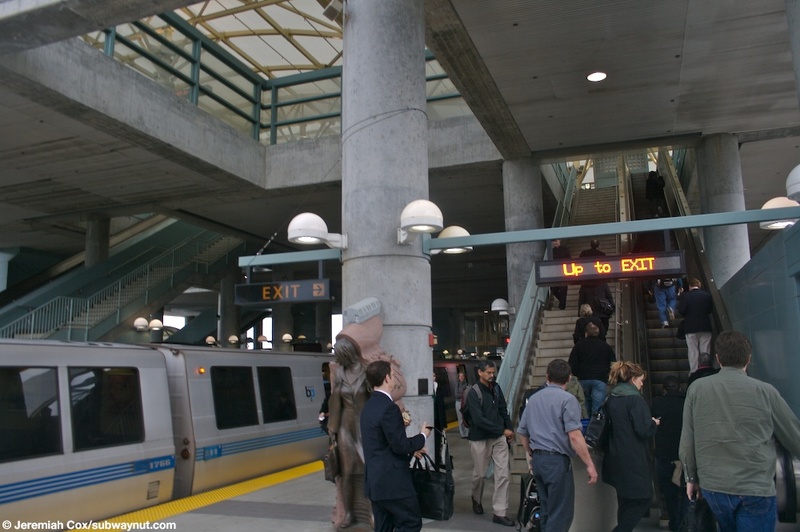 BART service is provided by one route, the Richmond Line on weekdays until 7:00pm the Pittsbrugh/Bay Point Line at all other times. 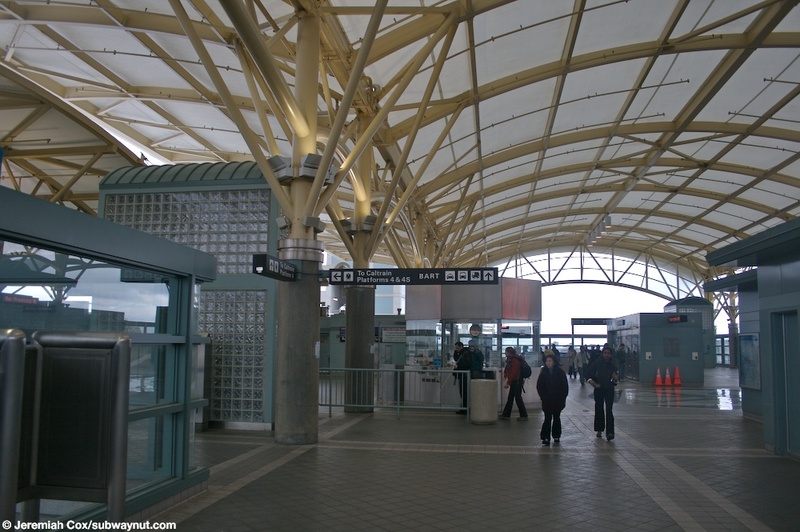 Service to SFO Airport during weekdays requires changing at San Bruno. 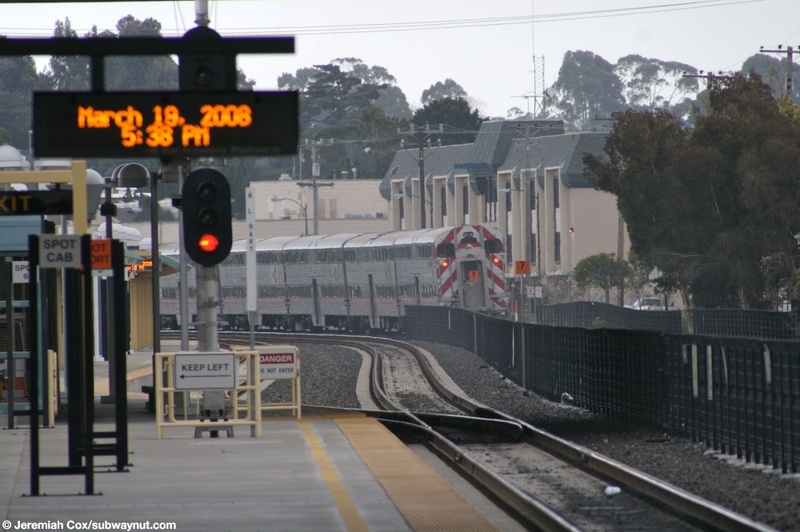 During evenings and weekends the Pittsburg/Bay Point line that terminates at SFO Airport during weekdays is extended one stop to Millbrae running in round-robin service, changing its direction of travel at the airport at the stub-end wye station. The station itself has a slightly complex track arrangement. 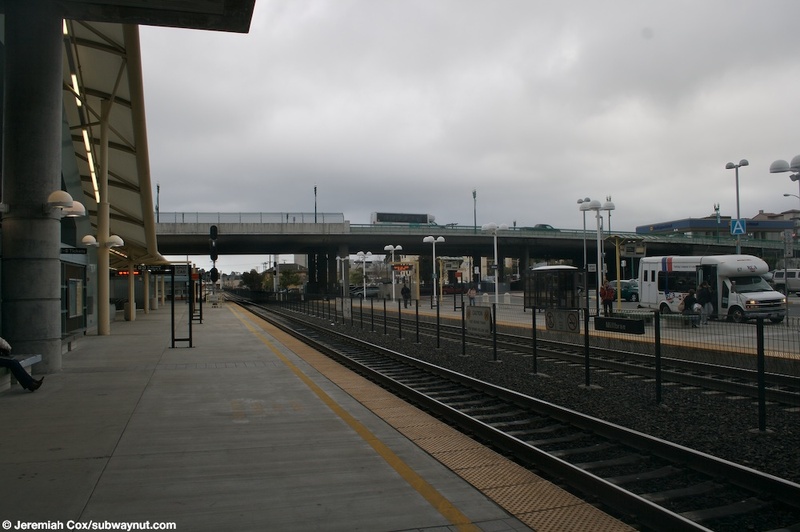 The main part of the station where Caltrain and BART normally platform has two tracks for Caltrain along with three tracks for BART. Just south of the station, a spur Caltrain track siding track (with switches from the San Francisco-bound track) switches off of the San Francisco-bound Caltrain track and has its own platform nestled between the siding track and the BART tracks that continue south of the station (with switches between all tracks) to become tail tracks used for storing BART trains following the Caltrain ROW going south of the station. 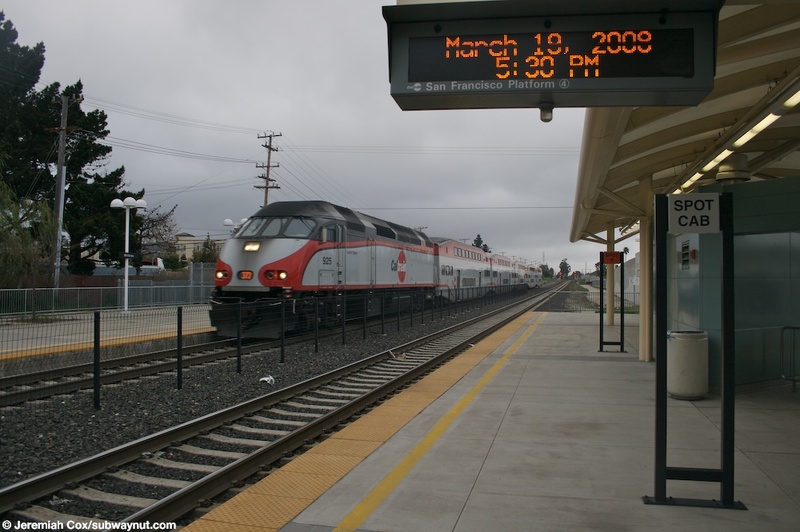 This track and platform were designed to short-turn Caltrains when it was thought many Caltrain riders from the south would get off at Millbrae and transfer to BART to continue into San Francicso but this ridership (partially caused by the more expensive fare, even when factoring in a transfer to MUNI) never materialized. The main station platforms begin beneath the overpass bridge of Millbrae Avenue and run north. The platform configuration for the main part of the station is a side platform for San Jose-bound Caltrain, the two Caltrain tracks, an extremely unique island platform used currently by San Francisco-bound Caltrains and all terminating and originating BART trains in regular service, followed by another island platform for the final two more BART tracks that isn't in regular service (it was used by the SFO Airport Shuttle train until it was discontinued less than a year into the station's existence). The platform shared by Caltrain and BART is extremely unique. Firstly it requires a tall fence/wall (that's a friendly looking but thick turquoise color) running down the middle of it, with about three fare control areas in the middle of it since Caltrain is open-POP and BART is a closed-fare system requiring tickets to me run through the fare gates to validated or tapped both upon entering and exiting for its distance-based fares. 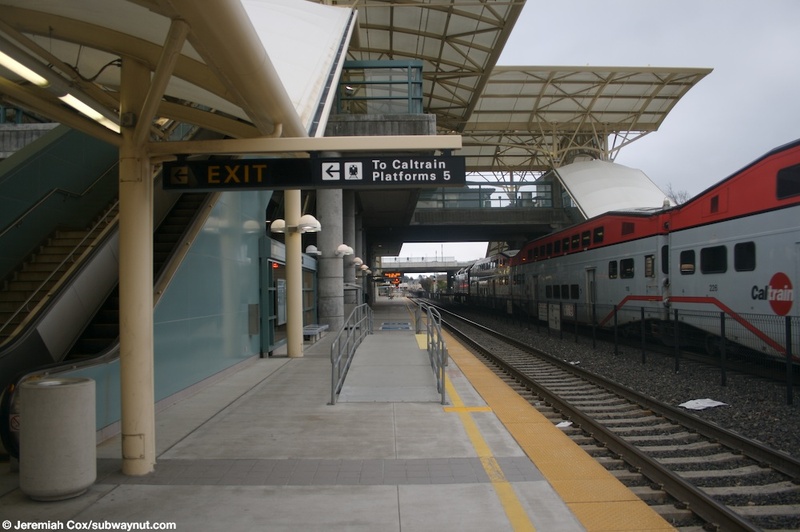 At the southern end of the Caltrain platform where the switch to the unused siding track begins is the entrance to the unused but modernized terminal platform (Platform 4S) that has modern BART signs two canopy structures covering about half the length of the platform. The platforms are all connected by an extremely wide overpass structure referred to as a concourse over the middle of the platforms. 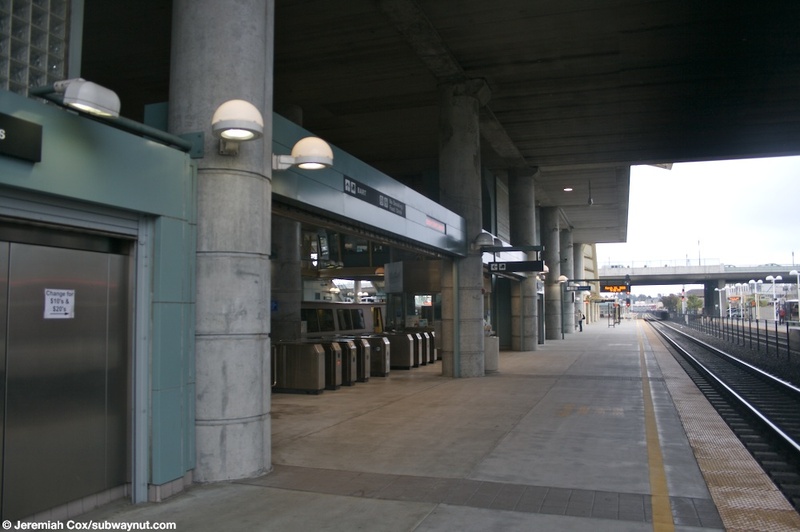 The overpass structure starts with two combined escalator/staircases and an elevator down to Platform 5 used by San Jose-bound Caltrains as well as the entrance area along this platform that is referred to on signs as Wets Plaza. Next it reaches platforms 3 and 4 the combined BART/Caltrain platforms. Here two separate areas on each side of the overpass within BART's fare control begin divided by an outside of fare control central area. Four total combined escalators/staircases lead down to this mega-platform. 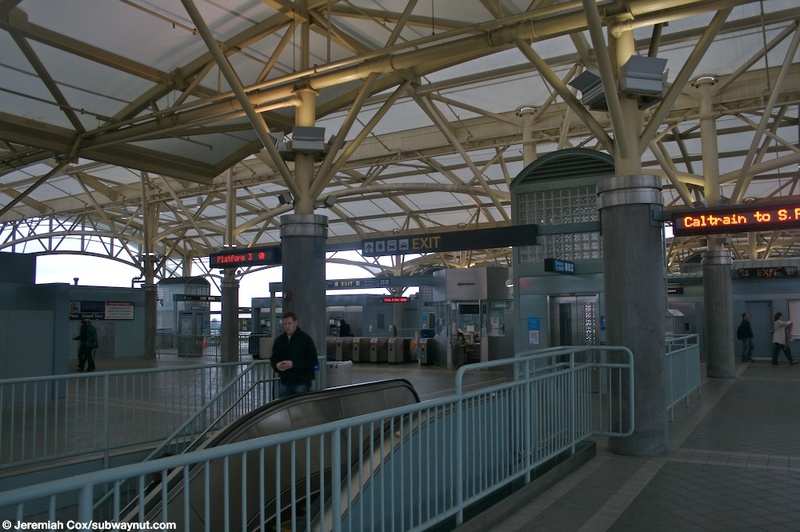 Two sets closest to the middle of the mezzanine are within BARTs fare control and lead down to the BART side of the dividing fence while the two staircases on the farthest sides of the overpass lead down to the Caltrain outside of fare control side. There is high turquoise fencing with Plexiglas at eye level to keep passengers from fare jumping over these staircases. 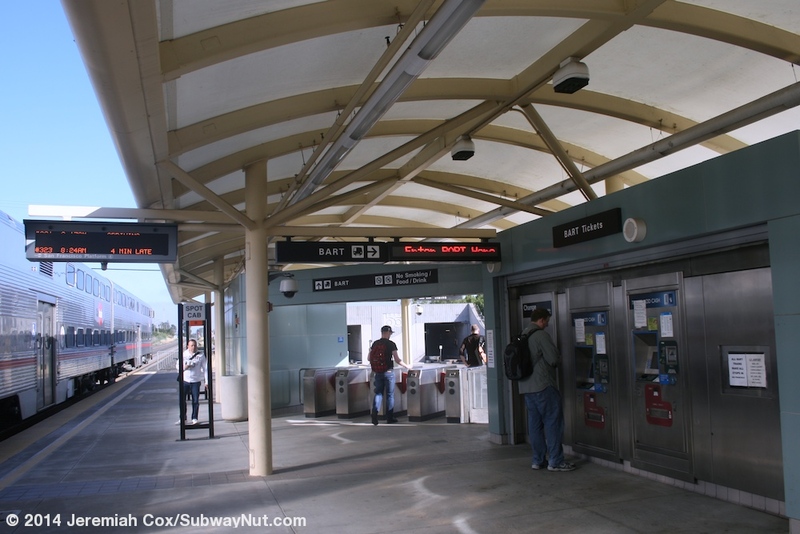 This platform also has two elevators, one to the Caltrain side outside of fare control and one within fare control. The unused in regular service BART island platform is next. This platform has two staircases, one combined with an escalators up to each half of the within fare control portion of the mezzanine (four in total). There is also the required elevator. The mezzanine finally ends at an elevator and combined up escalator/staircase down to ground-level on the East Plaza of the station where the main bus terminal is. There is also a covered passageway that leads to level 3 of the parking garage that is at the same level as the overpass. The overpass structure is covered by a high arching and airy, white and translucent canopy structure held up by beams with a yellow framework. This concourse structure extends to cover all staircases/escalators off the overpass and the platforms themselves. The platforms are covered for different portions. The San Jose-bound Caltrain platform has no coverings, the only covered areas for passenger to wait is beneath the concourse. The BART/Caltrain platform is covered for nearly its entire length. The unused BART only island platform has canopies that end just a bit beyond the final escalators down to the platforms. 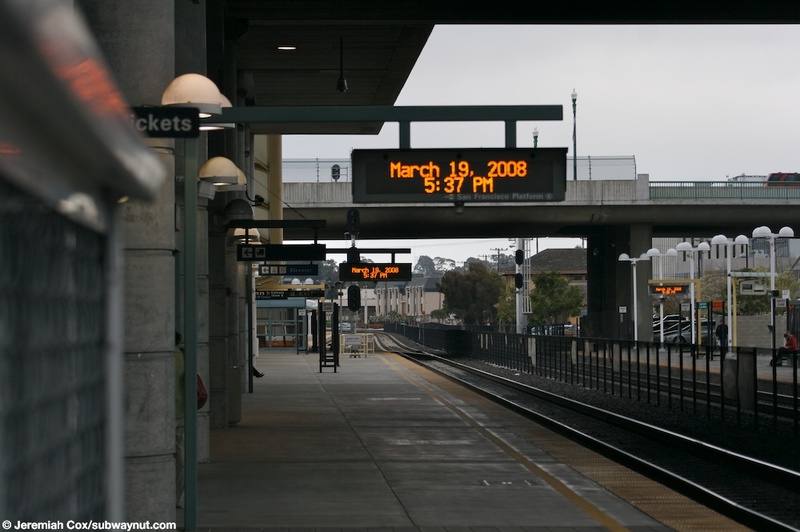 Signage is all in the black with white text BART format. There are a number of newer signs in the overpass that have the new green color for the station's exits described on them as the west and east plazas. The signage is poor enough for the complex station that there are a number of paper signs with the usual ones on the BART vending machines with the fares to frequent destinations plus others on the overpass structure to warn passengers that parking is for BART and Caltrain round-trip ticket holders only, not other commuters perhaps taking private shuttle buses down to Silicon Valley employers. The East Plaza of the station contains the station's 5 Level parking garage that only has a $2 daily fee. There are about 2,900 parking spaces at the station. The concrete garage has a clocktower entrance connecting all levels at its closest to the station side. This is along the northside of the plaza and stretches between the tracks to parallel Rollins Road. Going directly off the overpass and down to street level is the station's main bus loop with a grassy median in the middle of the long loop that stretches all the way to Rollins Road. There are approximately 14 bus bays each with stops beneath a long canopy structure that runs the length of the sidewalks along each side of the loop and contains wind-screened benches around each stop. A few more benches are fully exposed to the elements. The south canopy is shared by a driveway lane used by taxis and private passenger pick up/drop off. There is also a BART parking lot between the driveway and Millbrae Avenue and a final parking lot across Rollins Road that stretches all the way to Alvador Avenue. 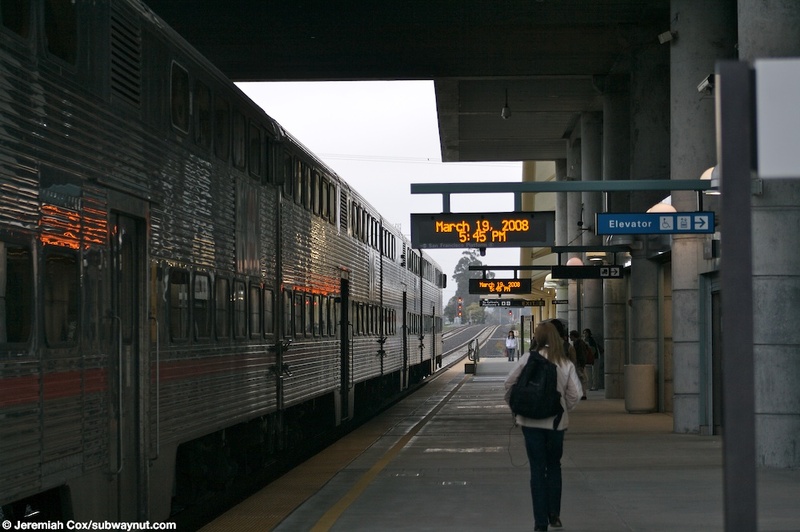 The West Plaza is directly along the Caltrain platform. It is accessed by California Drive (that Millbrae Avenue also passes above). In here are 175 Caltrain controlled $5 daily parking fee spaces and a small shuttle/taxi drop off island used by some station shuttles (including the free Shuttle to the now weekdays only Braodway Station). Towards the southern end of this parking lot, where the Caltrain platforms originally were, across from (but with no access to) Platform 4S built for the unused Caltrain short-turn siding and platform is the historic 1907 Caltrain depot. This depot was used by Caltrain until 2003 for a ticket office until the intermodal station opened. The gabled roof yellow building with green trim has a fenced off area outside of it. The station is now the http://www.millbraehs.org/millbrae-train-museum.html Millbrae Train Museum. There is a former Pullman Sleeping Car Civic Center on display. There are also a historic motorcar sitting under the eves of the station that once covered the now removed platforms. 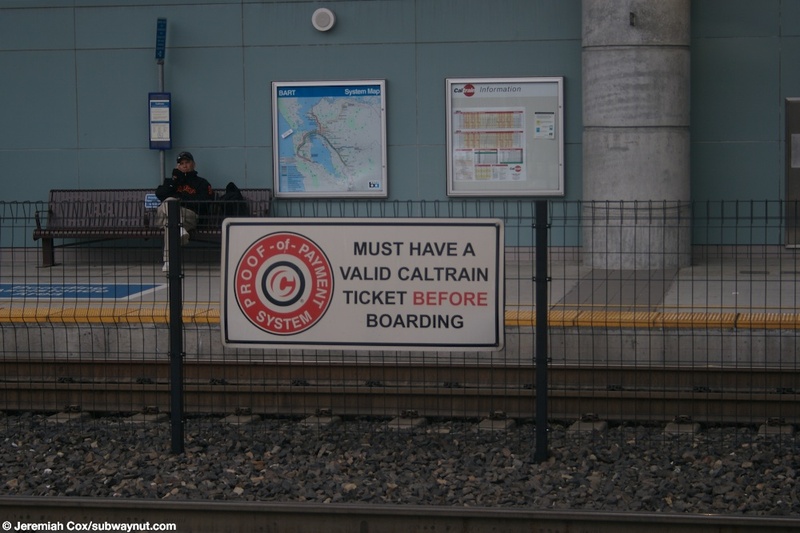 The Caltrain station before the intermodal station opened was a hold-out station with a side platform for San Jose-bound trains and a middle of the tracks island platform, don't enter until the train has arrived platform for San Francisco-bound trains. Passengers exit an incoming BART train at Millbrae at the height of the evening rush hour. Approaching the BART fare gates on the large upper mezzanine at the Millbrae station, underneath the cavernous canopy. 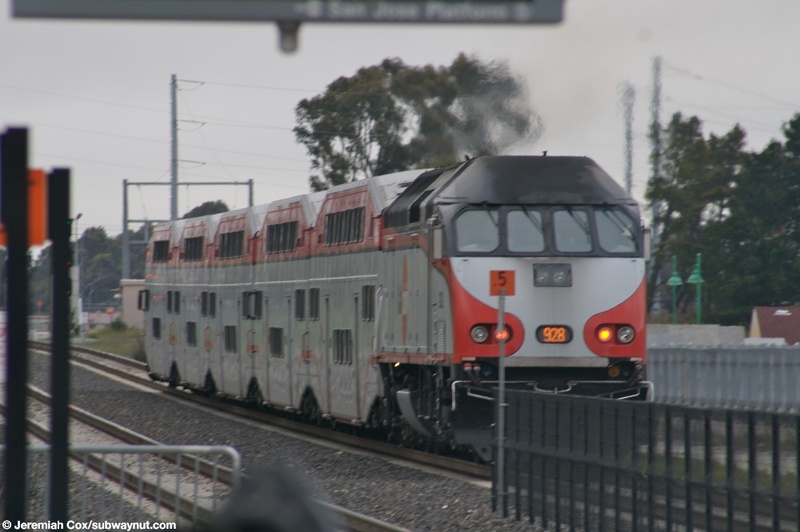 MPI MP36PH-3C #928 pushes a northbound train of five Bombardier BiLevel Coaches bound for San Francisco out of Millbrae Station. Looking across the tracks at Millbrae Station by a sign for the fact Caltrain uses a Proof-of-Payment system and that a valid ticket is required before boarding. 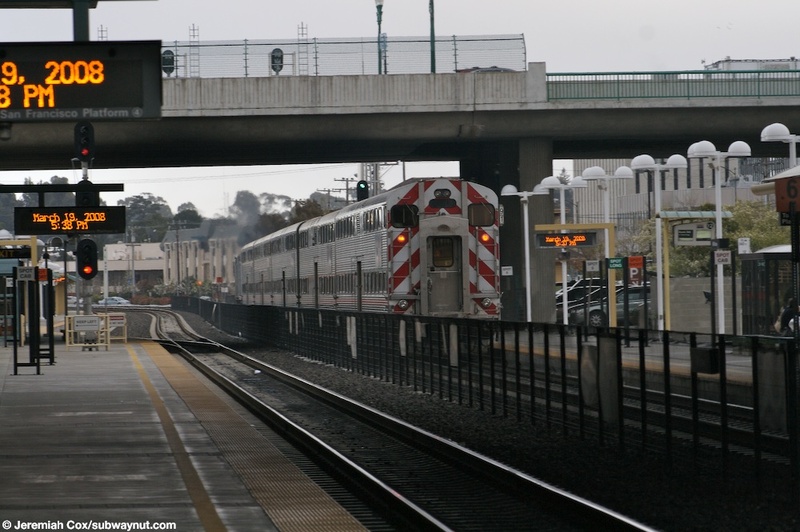 A view of the Caltrain side of the mezzanine at Millbrae, and its cavernous size. Looking across the relatively low fence to the BART area inside fare control and a staircase down to one of the two BART platforms at Millbrae. MPI MP36PH-3C #925 pulls a train of five Bombardier BiLevel Coaches of Baby Bullet Express train #372 into Millbrae so the train can make one of it's view stop on it's southbound run to San Jose. 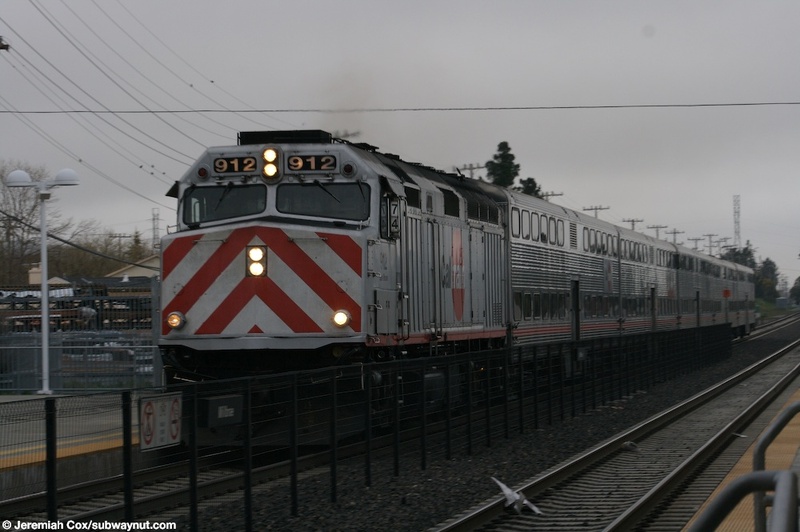 Another view of MPI MP36PH-3C pulling a Baby Bullet Express train into Millbrae. 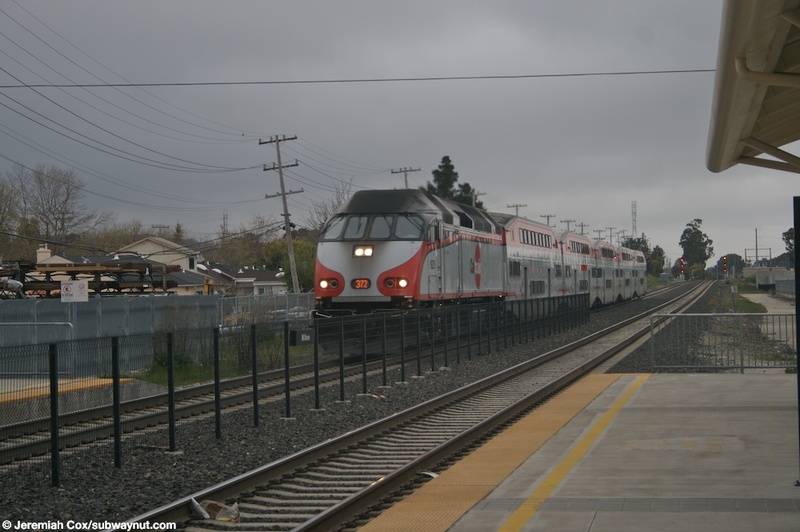 Looking down the northbound Caltrain platform at Millbrae, Bombardier Bilevel coaches #118 (Cab-car not on the end of a train) and #226 are stopped in the station. 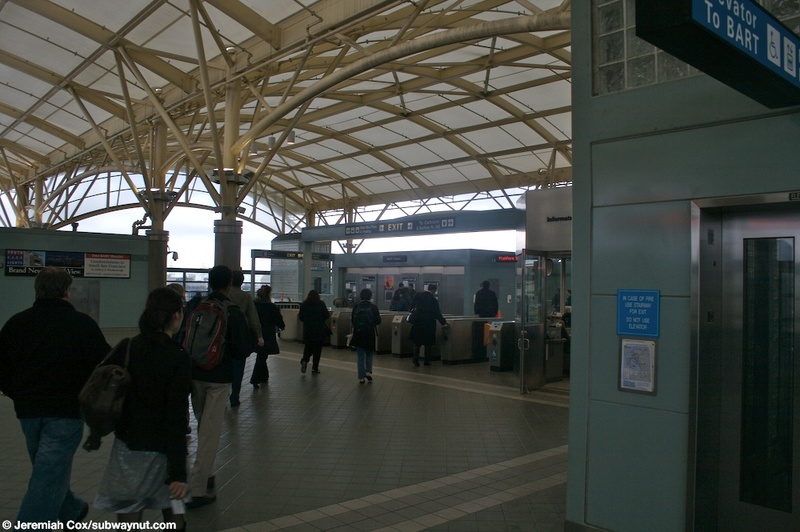 The northbound Caltrain platform at Millbrae has a very unusual feature, direct BART faregates from it into the BART system and the BART platform that most trains use to terminate. This is a view of them. The view down the northbound platform towards the northern end, bus bays for connecting buses are visible along with the various locomotive stop here signs. Looking underneath the large overpass on the northbound Caltrain platform at Millbrae where the faregates with a step free same platform transfer to BART are. EMD F40PH-2CAT #912 pulling Limited service train #274 of Nippon Sharyo bi-level gallery cars towards Millbrae that it will bypass. 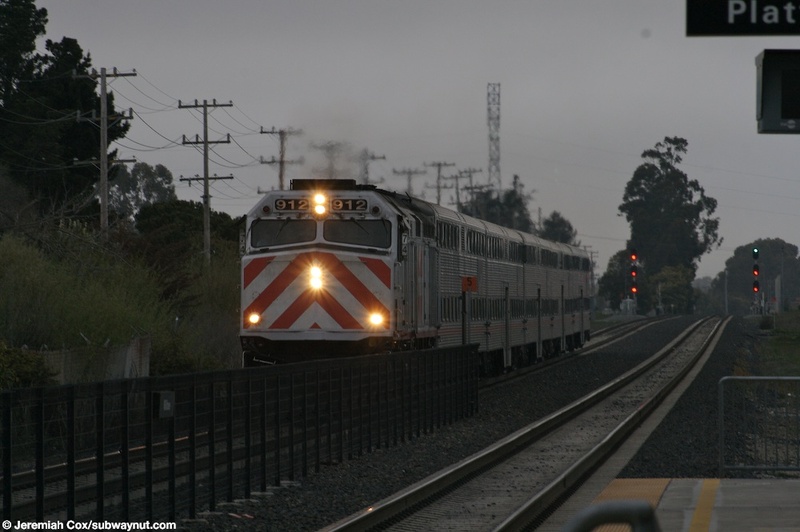 Limited service train #274 enters Millbrae to bypass it. The five Nippon Sharyo bi-level gallery cars of southbound Limited Service train #274 fades into the distance after bypassing Millbrae. The Nippon Sharyo bi-level gallery cars fade off into the distance south of Millbrae. Sings on the fence between the tracks at Millbrae for the directions of service to the two Caltrain destinations and a large warning sign for express trains and warning people to Stay off Tracks. A train of Nippon Sharyo bi-level gallery cab cars comes to a stop at Millbrae bound for San Francisco.